I Hate Fairlyand Vol. 1 Review! 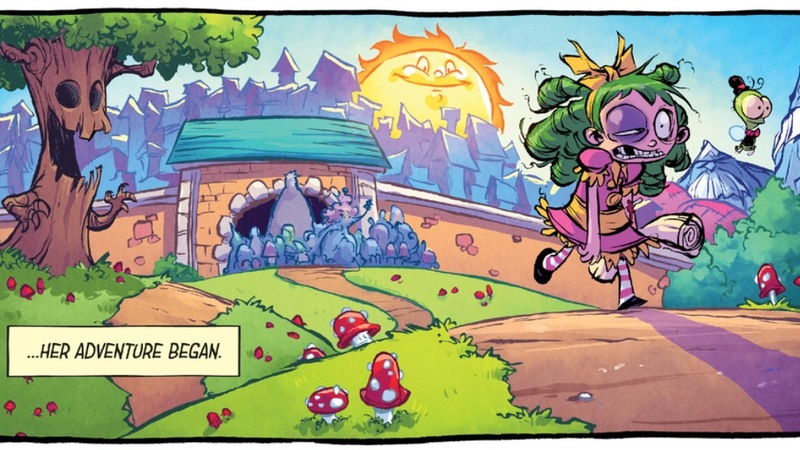 I Hate Fairyland is a hilarious and gory romp through the eponymous Fairyland by a thirty-seven-year-old little girl who has been trapped there since she was ten due to her lack of questing ability. In twenty-seven years, Gertrude has developed into the most foul-mouthed and dangerous denizen in all of Fairyland, doing basically whatever she wants including getting high, drunk, and murdering the crap out of anyone too annoying. Volume one is the cutest gore-fest I’ve ever seen. That phrase has never described anything more accurately. Skottie Young just sat down and decided, “You know what? Screw it”! There’s blood and guts all over the place, hell we get showered in the (new) narrator’s guts at the beginning of every issue! We’ve got a thirty-seven-year-old woman in the body of a ten-year-old trying to seduce a frog-man. Alcohol, drugs, and all other kinds of debauchery you can image litter the adorable landscapes of this child-dreamland. Of course, this freedom doesn’t just apply to the author/creator. The heroine, Gertrude is like Skottie’s author avatar as he decides to live out his darkest fantasies about slaughtering anything and everything. Stars too bright? Blow them to pieces. Who cares if you misunderstood the riddle and ripped the hearts out of every cute giant creature in a hundred block radius. Besides, the law of the land can’t touch you! It’s the ultimate gore-filled dream of freedom. [Read more…] about I Hate Fairlyand Vol. 1 Review! Seriously, who doesn’t love Rat Queens!? We’re fifteen issues in and the latest arc is on the cusp of its big finale. This issue is a lot more serious than per the Rat Queens usual, but S#&% is going down! We’ve learned a lot about the Queens from the start of this arc and the hits just keep on coming. Hold tight to your heart strings on this one, fifteen is coming for every one of those suckers. We’ve got love, loss, betrayal, and holy crap those plot twists! Like the solicit says: “A betrayal changes the Rat Queens FOREVER! Prepare to be shocked! You did not see this one coming!” [Read more…] about Rat Queens #15 Review! Tokyo Ghost Vol. 1: “Atomic Garden ” Review! The world has fallen to a “techno-pocalypse” dystopia where people spend their lives addicted to techno-organic internet feeds with nano-bot delivery systems that can inject you with pretty much anything you could want. The nation of Los Angeles is home to the virtually enslaved, the criminal poor, cannibals, and the gangster corporate ruling class that oversees it all. Police have been disbanded in favor of the private sector and the corporate enforcers of choice are the Constables. [Read more…] about Tokyo Ghost Vol. 1: “Atomic Garden ” Review! B-Squad: Soldiers of Misfortune Vol. 1 — Review! It’s “The Expendables” meets “Archer” in a wild and hilarious romp featuring bottom-of-the-barrel mercenaries taking on the jobs no one else will! Every issue the wheel of fate turns and claims another member of the squad to make room for someone new to join the next crazy adventure. You’ll laugh. You’ll Mourn. You’ll yell “WTF! ?” [Read more…] about B-Squad: Soldiers of Misfortune Vol. 1 — Review!